This Beautiful Dream Pillow is Handmade and filled with a blend of Herbs and Essential Oils including Marigold & Jasmine Flowers evoke prophetic Dreams. I have also included some tiny pieces of crystal, Tigers Eye for protection and to help you 'see' with clarity. 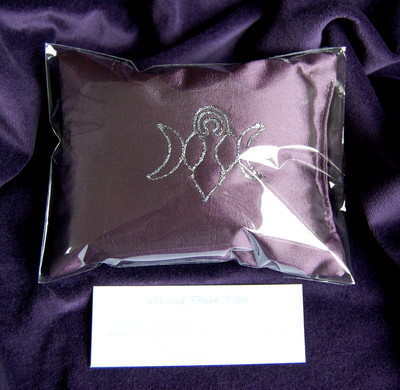 The Pillow is 5 1/2" by 4", comes in its own cellophane bag to retain freshness this pillow has been Hand Decorated with a Lovely Goddess & Moon motif.